I thought it would be fun to do some number-crunching on my sales data. I took all of my XBLIGs that have been out for more than 9 months, plotted rating vs sales, and added a line of best fit to the plot. Because there are only five points, it’s obviously not a very reliable line, but hey, just for kicks, right? Barf and Beer (2.79): It was the first drinking game on Xbox, and pretty crass. The mediocre rating didn’t matter of course. It was both loved and hated, and spent several weeks at the #1 downloaded spot. Back in the day (2009) you didn’t get rich for that, but because it cost $2.50 (400 MSP) at the time (the lowest price point available), B&B has brought in the most money of any product I’ve released. Frankly though, I don’t think it would pass in today’s caustic peer review environment, (one person actually failed it for being too gross, but you can get away with just a single failure). 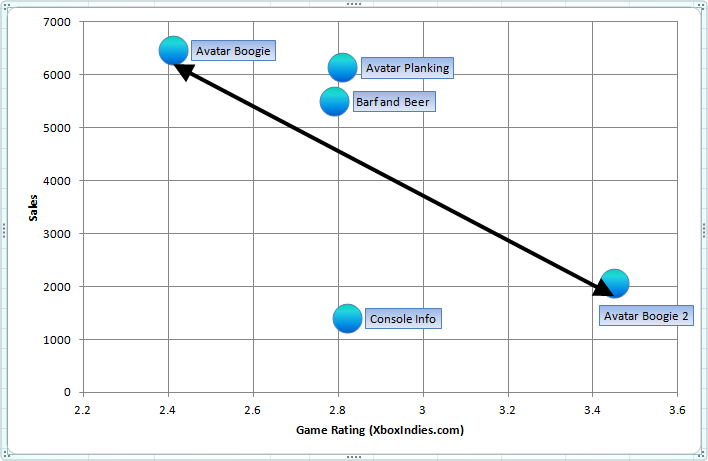 Avatar Boogie (2.41): Highest quantity of sales and the lowest rating. It was one of the first avatar products; for months, Microsoft had somehow managed to avoid releasing any decent avatar games after avatars came out, so people were starving for avatar-related content. Avatar Boogie didn’t allow players to use their own avatars though, which contributed to the low ratings (sadly, the feature was banned in review on a technicality). In Avatar Boogie 2 (3.45), I worked around the no-player-avatar limitation and added a ton of music and dances. People rated it way higher than the first version (and the highest of any of my products), but it didn’t mean they bought it. Was that because Avatar Boogie-ing wasn’t novel anymore? Because there were more avatar products out? Box art didn’t draw people in? Probably a mixture. Console Info (2.82): It sold okay for what it was. Its main selling point is that it measures the speed it can access your hard disk or USB stick, which makes it a very niche app. Avatar Planking (2.81) created a firestorm of anger and indignation on the internet, especially among the type of people who just sit around and find things to become outraged at. But that, and probably the ridiculous boxart and screenshots compelled a ton of people to download it, and I think the people who played appreciated the humor, even as they shook their heads. It is on-track to pass Avatar Boogie and become my #1 game in terms of overall sales. So basically, ratings don’t matter unless they’re really, really high. An average rating doesn’t mean your stuff can’t be awesome. The Wayans Brothers have already proven this in the movie industry. I also recommend reading this awesome article written by DigitalDNA games, one of the more successful devs on the service. It breaks down reasons why games succeed or don’t, and my findings are consistent with it. Now here are the actual numbers for you to enjoy/revile. May your ratings be either super-high or super-irrelevant!